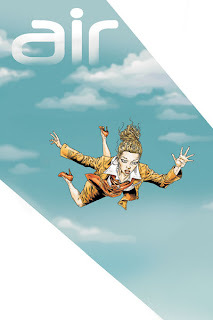 Air is a comic book series created by writer G. Willow Wilson, published by Vertigo Comics. I don't know how Vertigo does it, but they continually produce riveting titles. It's rare that I've been disappointed by this company, and Air, thankfully, continues the winning streak. 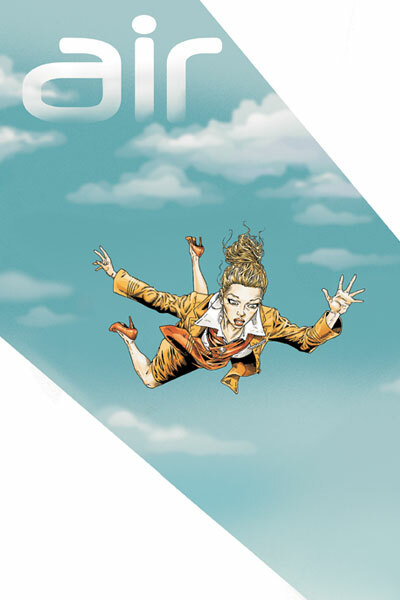 Air tells the story of an acrophobic flight attendant named Blythe who is whisked away on a grand adventure. On a routine trip, she is tricked by a group called the Etesian Front into transporting terrorist plans as she flies from country to country. She meets a mysterious man on a flight named Zayn, an Interpol agent in disguise, and together they discover that the Etesians are the real terrorist. As the story continues, Blythe and her friends traverse across different lands trying to stop the Etesians and their nefarious plans. Sounds normal right? It's not so simple though as I'm trying to keep the spoilerish things out of this review. The story is wonderfully put together with the ending of each issue gripping you as you anxiously anticipate the next issue. But what I really like is how Wilson unfolds the story. The first 3 issues starts off as just a straight up dramatic story, nothing too spectacular and then *BAM*... in issue 4 they throw in some sci-fi/supernatural elements at you. It really spins the whole story but in a good way. As the story progresses more fantasy elements are explored and well, let's put it this way, *SPOILER* Amelia Earhart joins Blythe's party. They even create this fictional backstory to explain what happened to her. This is the first work by Wilson that I've read and the first art by M.K. Perker that I've seen. The story, like I said, I was amazed with, the art though I'd say is good, but it just doesn't grab me as great. There's something about Perker's style in drawing characters that make them look too long and it just doesn't look right all the time. But that's just being nitpicky, it's still good. It's definitely worth a read if you can find it in trade paperback. It's received outstanding reviews from the critical community with writing legend Neil Gaiman describing it as a story that starts off like [Salmon] Rushdie and "parachutes off" into [Thomas] Pynchon. I've read the first twenty issues so far and I can't wait for the next. Til next time, later geeks!